The Kalmar Nyckel Foundation and Glass Entertainment Group have announced the premiere of the jointly produced feature documentary, Kalmar Nyckel: The Forgotten Journey. The film will premiere Tuesday, December 19th, at 9 pm on WHYY TV. Kalmar Nyckel: The Forgotten Journey tells the story of Sweden’s first voyage to the New World. It’s an epic adventure about an ordinary Swedish ship and the extraordinary expedition that launched the colony of New Sweden in 1638 – right here in the Delaware Valley. With a maritime perspective that features stunning sailing sequences from today’s replica Kalmar Nyckel and commentary from some of the world’s leading experts, the documentary sheds new light on the Swedish colonial experience in North America. “We were attracted to the story of the Kalmar Nyckel because it has all the right ingredients,” said Ben Fetterman, Executive Producer of the film. “It is a story of heroism, adventure and exploration, all contained on a 17th-century vessel, which made for a fascinating narrative. One special part of our documentary is that our cast and crew recreated the harrowing journey of this historic voyage on the modern Kalmar Nyckel, sailing the same waters the original ship passed over nearly 400 years ago! It makes for great TV,” Fetterman continued. The film, airing on WHYY, PBS’s member television station serving the greater Philadelphia (PA) area and licensed in Wilmington, Delaware, is set to premiere on December 19th. The producers feel WHYY is a perfect home for the feature documentary since its topic matter and landmarks anchor the story and has great relevance to WHYY’s viewing market. Kalmar Nyckel: The Forgotten Journey was produced by Glass Entertainment Group in partnership with the Kalmar Nyckel Foundation. 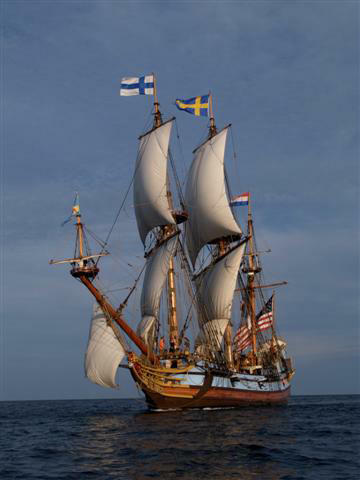 Learn more about the Kalmar Nyckel when you visit its home port on the Wilmington Riverfront.